Google's already said you'll need to buy a Chrome OS machine if you want it officially, but if TechCrunch's sources are right, they could be launching Google-branded hardware for the platform, much like they're doing with the Nexus One. Sure, you may've already downloaded an early Chrome OS build on your current machine, but unless you want it to be your sole platform, and running just the way Google intended, then you'll need to buy the official hardware. Acer's stated its intent to be first with a product release, presumably at the tail-end of next year, but ASUS, HP, Lenovo and Toshiba are also involved in the Chrome OS project too. A "request for proposal" has already been issued to potential suppliers, such as those mentioned above, supposedly listing the specifications Google would like to see in that first netbook. 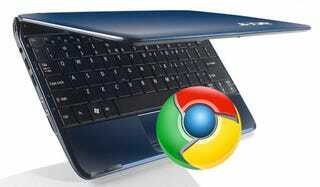 Google is believed to be working with just the one manufacturer, to build the ideal netbook. TechCrunch's sources are claiming they'll be 3G-embedded, and quite possibly subsidized by a carrier. "I'd be willing to bet one of our writers' right hands that it's ARM [as opposed to an Intel Atom processor]. And I'd even go out on a limb and suggest that they may very well be targeting Nvidia's Tegra line." Adobe, Freescale, Qualcomm and Texas Instruments are the other parties already working with on the Google Chrome OS project, so presumably the netbook will contain some components from them as well.